Just as their predecessors of the 1920s always denied the existence of “Jewish quotas,” top officials at Harvard, Yale, Princeton and the other Ivy League schools today strongly deny the existence of “Asian quotas.” But there exists powerful statistical evidence to the contrary. Each year, American universities provide their racial enrollment data to the National Center for Education Statistics, which makes this information available online. After the Justice Department closed an investigation in the early 1990s into charges that Harvard University discriminated against Asian-American applicants, Harvard’s reported enrollment of Asian-Americans began gradually declining, falling from 20.6 percent in 1993 to about 16.5 percent over most of the last decade. This decline might seem small. But these same years brought a huge increase in America’s college-age Asian population, which roughly doubled between 1992 and 2011, while non-Hispanic white numbers remained almost unchanged. Thus, according to official statistics, the percentage of Asian-Americans enrolled at Harvard fell by more than 50 percent over the last two decades, while the percentage of whites changed little. This decline in relative Asian-American enrollment was actually larger than the impact of Harvard’s 1925 Jewish quota, which reduced Jewish freshmen from 27.6 percent to 15 percent. 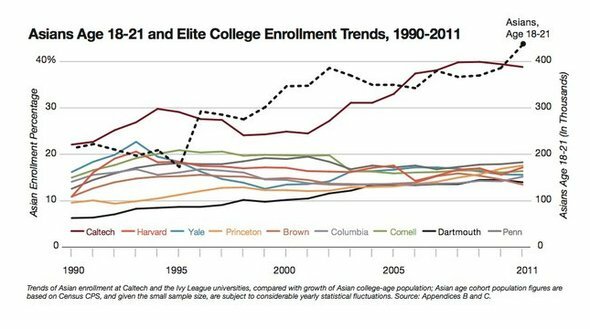 The percentages of college-age Asian-Americans enrolled at most of the other Ivy League schools also fell during this same period, and over the last few years Asian enrollments across these different universities have converged to a very similar level and remained static over time. This raises suspicions of a joint Ivy League policy to restrict Asian-American numbers to a particular percentage. Meanwhile, the California Institute of Technology follows a highly selective but strictly race-neutral admissions policy, and its enrollment of Asian-Americans has grown almost exactly in line with the growth of the Asian-American population. The last 20 years have brought a huge rise in the number of Asians winning top academic awards in our high schools or being named National Merit Scholarship semifinalists. It seems quite suspicious that none of trends have been reflected in their increased enrollment at Harvard and other top Ivy League universities. This entry was posted in Immigration/Race, Meritocracy, Published and tagged Immigration/Race, Meritocracy, New York Times, Pub. Bookmark the permalink.